While Microsoft will begin “support” for Windows Phone 8.1 on June 24th, it is entirely likely we are going to see the first device with Windows Phone 8.1 out of the box, the Lumia 630, much sooner than that. In fact, for €149.99 ($206), you can pre-order any available color (black, yellow, orange, green, and white) Lumia 630 in Italy, with shipment expected to begin on May 20th. 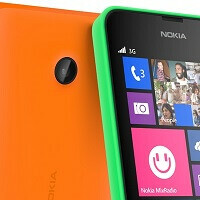 A May release date is also likely for the new Lumia in the land down under as well. AusWinPhone is reporting that the Lumia 630 will be available at all the major retailers starting May 27th for AU$249 ($233). Vodafone Australia will also carry the new Windows Phone in-store and online beginning June 4th with prices starting at AU$179 ($167) with pre-paid service. In addition to being the first with Windows Phone 8.1 installed, the Nokia Lumia 630 and Lumia 635 are also the first Windows Phones with on-screen navigation keys. The 4.5-inch screen is not HD, but it does have Nokia’s ClearBlack treatment, meaning it will be quite usable in direct sunlight. The 8GB of storage is expandable, accepting microSD cards up to 128GB. The Nokia Lumia 635 is coming to AT&T and T-Mobile in the United States, where it packs the same specifications as its 630-cousin, but adds LTE connectivity to the mix. This just in: NokiaFTW moves to Italia. Just in: Sauce is a NokiaFTW fanboy! He is spreading lies about the 630. Saying it has LTE when it does not have LTE. The 635 is the one with LTE. All of them only come with 512mb of ram and a 854x480 LCD display. Not even Nokia's own refocus app will support working on some photos. 512mb is too low for any device today, unless the phone is going to emerging markets. The L635, the LTE variant, will be heading to markets where LTE is a big deal, i.e. Uk, USA, Canada, East Asia etc. In these places, the 635 will likely outsell the Moto G due to just LTE. In emerging markets, eg: here in India, the L630 dual sim is priced at 11,500 INR, while the Moto G dual sim is north of 15,000 INR. Again, due to better brand recognition of Nokia here, the L630 will outsell the Moto G. The single sim variant is also quite a bit cheaper than the Moto G. So yeah, I'm lying. FWVGA (854 x 480) = fail. I think the L630/635 has a few advantages over the Moto G such as LTE, expandable storage (upto 128GB), removable battery, probably a better camera since its Nokia, long software support. The Moto G on the other hand also has a few advantages over the L630/635 such as a slightly higher resolution display, slightly more RAM (although WP works just fine with 512MB of RAM) & a front camera. Its just a matter of priorities and usage really. Those who want more flexibility should probably go for the L630/635 since it offers LTE & expandable storage. However, those who want a great phone at a great low price and want customization and a front camera should go with the Moto G. Both are equal IMO. Technically he said 630/635 the 635 is lte. While slow mo is not found on any lumia it is also not found on all droids either. You can download Slowly for windows phone for slow mo, after all the power is all in the apps right? Also usb otg support could be fun, i can not fathom using my usb stick in such a way on my device, not since i have started cloud storage with one drive. I don't think one is inferior to another. As I have written above, both have distinct advantages over the other. 630/635 has LTE & expandable storage, while the Moto G has a front cam and HD screen. The rest is pretty similar. As I said, everyone has different priorities. For you, the screen res is important, while for me, expandable storage. Expandability is one of the main reasons why I'm not gonna get the L930 & stick with my L1520. Still, taking nothing away from Motorola. They've done a brilliant job and have got themselves right back into the smartphone market. Fzacek is correct. For most people, there is no real point of having a smartphone, especially one with LTE, with a low resolution screen and so little RAM. 512MB is the same anemic amount of RAM as the low end Lumia 520 phone. The Lumia 520 was replaced by the Lumia 525 (with 1024MB RAM and no other changes) as 512MB is just enough RAM for many usage scenarios. I must have NFTW virus. ... 512MB is just NOT enough RAM for many usage scenarios. Replaceable Battery and an Expandable Storage is more important for me than an HD display. Its not always about the screen. Absence of a front facing camera and 1GB RAM is a deal breaker for sure, but I still might get one cos other than for video/image editing and graphical games there's no need for 1GB on a WP device. And if you really want to play games then having just 1GB wont be enough as you'll need better CPU/GPU as well and that's where the flagships comes..Its purely down to personal preferences. Go ahead and buy 930. 620 > 630 And, cheaper. Sadly. The L620 doesn't support micro SD cards of upto 128 gigs, neither does it have an LTE variant. Also, the L620 have a miniscule (3.7 inch) display in this day and age. The 630/636 > 620. In certain ways 620 is a better option..for instance its got better ppi, a front facing camera, flash, dual core Krait CPU which is on par with snapdragon 400 on 630 for normal day to day usage. 128GB SD card costs a lot and most of the users wont use such a high capacity one. But I'm getting the 630 as it got dual sim and a larger screen (non HD display is OK with me). The rest of the features are all similar..
Great I hope Windows Phone keeps the excellent momentum in moving forward . So far they're promising and delivering .